There are approximately 5,527,698 speakers throughout India, according to the Census of 2001. 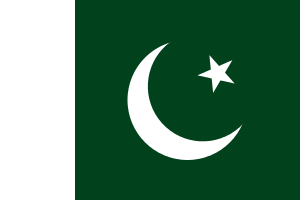 According to the 1998 Census there were 132,450 Kashmiri speakers in Azad Kashmir, Pakistan. According to Professor Khawaja Abdul Rehman the Kashmiri language, spoken in the Neelum Valley, is on the verge of dying out. The digraphs of Aspirated consonant are as follow. 1 2 "Kashmiri: A language of India". Ethnologue. Retrieved 2007-06-02. 1 2 3 4 Sociolinguistics. Mouton de Gruyter. Retrieved 2009-08-30. ↑ Hammarström, Harald; Forkel, Robert; Haspelmath, Martin; Bank, Sebastian, eds. (2016). "Kashmiri". Glottolog 2.7. Jena: Max Planck Institute for the Science of Human History. 1 2 S. S. Toshkhani. "Kashmiri Language: Roots, Evolution and Affinity". Kashmiri Overseas Association, Inc. (KOA). Retrieved 2007-06-02. ↑ Shakil, Mohsin (2012). "Languages of Erstwhile State of Jammu Kashmir (A Preliminary Study)". ↑ "Up north: Call for exploration of archaeological sites". June 5, 2015. 1 2 Krishna, Gopi (1967). Kundalini: The Evolutionary Energy in Man. Boston: Shambhala. p. 212. ISBN 978-1-57062-280-9. ↑ "The Constitution of Jammu and Kashmir (India)" (PDF). General Administrative Department of the Government of Jammu & Kashmir (India). Archived from the original (PDF) on May 7, 2012. Retrieved 2007-06-02. ↑ "Kashmiri made compulsory subject in schools". One India. Retrieved 2016-01-01. ↑ "Sarada". Lawrence. Retrieved 2007-06-02. ↑ "The Sharada Script: Origin and Development". Kashmiri Overseas Association. Retrieved 2009-07-07. 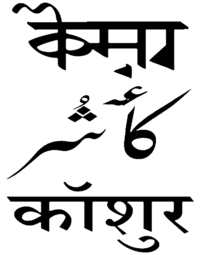 ↑ "Kashmiri (कॉशुर / كٲشُر)". Omniglot. Retrieved 2009-07-07. ↑ Daniels & Bright (1996). The World's Writing Systems. pp. 753–754. ↑ "Valley divide impacts Kashmiri, Pandit youth switch to Devnagari". Indian Express. Retrieved 2009-07-07. ↑ "Devnagari Script for Kashmiri: A Study in its Necessity, Feasibility and Practicality". Kashmiri Overseas Association. Retrieved 2009-07-07. ↑ "Koshur: Spoken Kashmiri: A Language Course: Transcription". Retrieved 21 May 2014. ↑ Edelman (1983). The Dardic and Nuristani Languages. ↑ "Dr. Shashishekhar Toshkhani: The Literary Works". Kashmir News Network. Retrieved 2009-08-21.